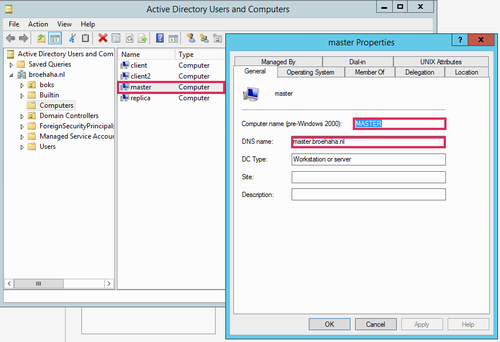 As part of an ongoing research project for Fox Technologies I had a need for a private Windows Active Directory server. 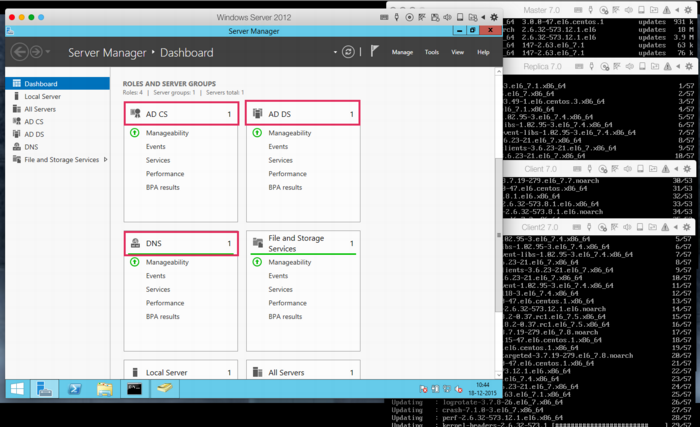 Having never built a Windows server, let alone a domain controller, it's been a wonderful learning experience. The following paragraphs outline the process I used to build a Windows AD KDC and how I set up the initlal connections from the BoKS hosts. I run all my tests using the Parallels Desktop virtualization product. The first screenshot below will show five hosts running concurrently on my Macbook Air: a Windows Server 2012 host and four hosts running RHEL6 (BoKS master, replica and two clients). Even installing Windows Server 2012 proved to be a hassle, insofar that the .ISO image provided by Microsoft (for evaluation purposes) appears to be corrupt. Every single attempt to install resulted in error code 0x80070570 halfway through. This is a known issue and the only current workaround appears to lie in using an alternative ISO image provided by a good samaritan. Of course, one ought to be leery about using installation software not provided by the actual vendor, so caveat emptor. Once the installation has completed, setup basic networking as desired. Along the way I opted to disable IPv6 as this would make the setup and troubleshooting of Kerberos a bit more complicated. This tutorial by Rackspace quickly details how to setup the Domain Services. In my case I set up the forest "broehaha.nl" which matches the name of the domain (and my LDAP directory on Linux). Setting up the CA (certificate authority) requires stepping through a wizard, using the default values provided. You may now SCP the windows_ca.cer file to the various Linux hosts (for example by using pscp, from the Putty team). Now it's time to put some data into DNS and Active Directory. Using the "AD Users and Computers" tool, create Computer records for all BoKS hosts. These records will not automatically include the full DNS names, as these will be filled at a later point in time. Using the DNS tool, create a forward lookup zone for your domain (broehaha.nl in my case) as well as a reverse lookup zone for your IP range (10.211.55. * for me). In the forward zone create A records for your Windows and your Linux hosts (the wizard can automatically create the reverse PTR records). See below screenshots for some examples. My Linux hosts were already installed before, as part of my BoKS testing environment. All hosts run RHEL6 and BoKS 7.0. The master server has Apache and OpenLDAP running for my Yubikey testing environment. As was said, NTP should be running to have time synchronization among all servers involved. ldapsearch -vv -Y GSSAPI -H ldap://windows.broehaha.nl -b "DC=BROEHAHA,DC=NL"
If you now use "AD Users and Computers" on the Windows server, you'll notice that the fully qualified DNS name of the Linux host has been filled in. Basic AD connectivity has now been achieved. We'll start putting it to good use in an upcoming tutorial.